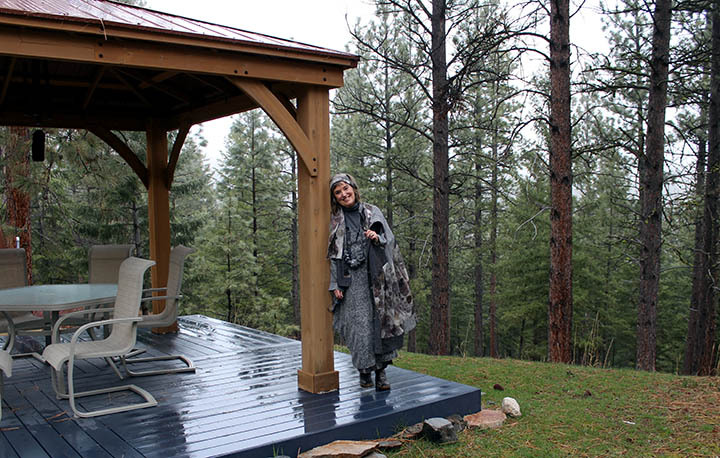 Welcome to DREAMTIME ATELIER, my new studio in the beautiful Bitterroot Mountains of Western Montana. 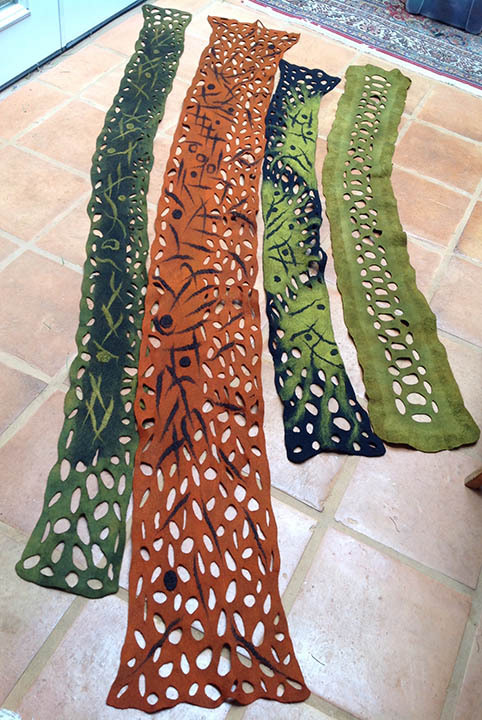 I am a Professional Textile Designer, Felter, and Shibori Artist and I am Excited to offer here for the first time, workshops from my studio……..
Below is a listing of the Beginning workshops I will be offering. In Felting, Nuno Felting, And Shibori Dyeing. Private, intermediate, and advanced classes are available upon request. The Classes are small with 4 students maximum and 2 students minimum and offer a workshop atmosphere that is casual, relaxing and focused on learning and having fun with the creative process. Students will need to bring their own lunches, and liquids to drink. The Fees for each workshop are listed with the workshop and will vary depending on materials provided, and the complexity of the workshop. Contact me at textilliannomad@gmail.com, FOR INFORMATION REGARDING INTERMEDIATE AND ADVANCED CLASSES AND FEES. In this workshop you will learn how to create a ONE OF A KIND fabulous felted scarf. You will learn how to layout your wool, working with color, and interesting design elements to make your scarf truly one of a kind. MATERIALS FEE: $20.00 (payable at time of class) Materials include hand dyed merino wool, some design elements, olive oil soap, use of felting supplies and a basic felted scarf handout. An optional list of materials to bring for design elements will be supplied at signup. 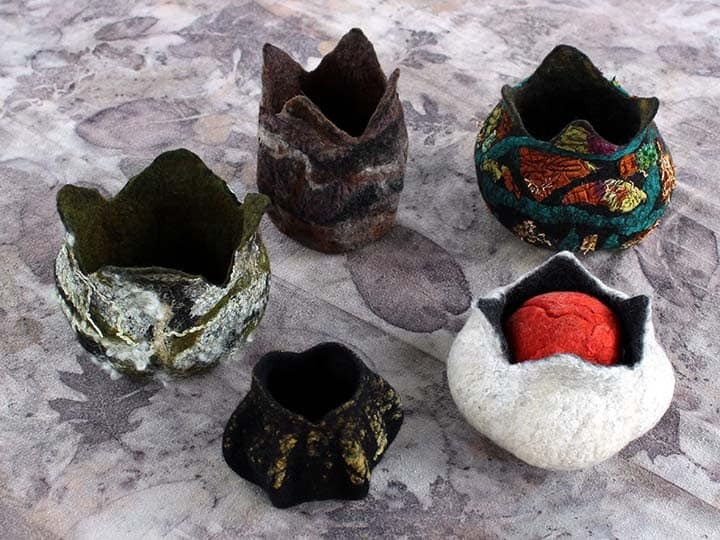 Explore the exciting possibilities of creating 3 dimensional felted Vessels/Pods/ Bowls. You will learn how to work with the wool and create a 2 sided piece of felt that is hollow in the center. 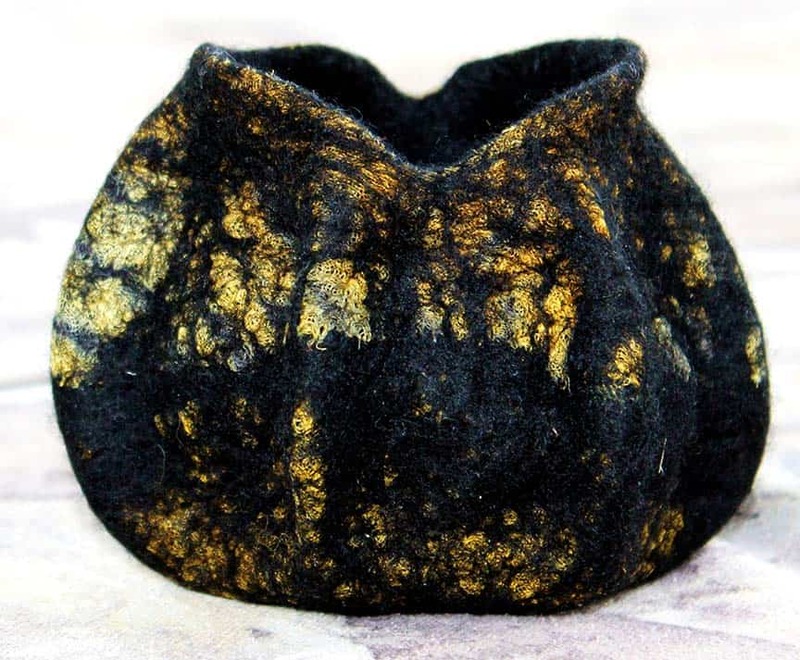 Felted Vessels/Pods /Bowls are an eye opening journey into the magic of felted wool and how to create with it 3 dimensionally! MATERIALS FEE: $20.00 (payable at time of class) Materials include hand dyed Merino wool, some design elements, olive oil soap, use of felting supplies and a basic 3-d Vessels/Pods/Bowls handout. An optional list of materials to bring for design elements will be supplied at signup. In this exciting workshop, we begin to explore the wonderful world of Nuno Felt. This is a process of felting wool and silk fabric together. Nuno felt lends itself beautifully to art wear because of the lightness and drapey qualities of the silk fabric coupled with the inherent warmth of wool fibers and the wonderful resulting texture that occurs with shrinkage. This is a workshop designed for Quilters, Felters, Sewists, and anyone who loves cloth and pattern. Shibori is the Japanese term for the traditional techniques of what we know here in the US as “tie-dye”. In this class we will start with 2 of the most simple forms of Shibori. Nui Shibori (Stitched Resist) and Itajime Shibori (fold and clamp). You will learn about using Procion Dyes (cold water dyes) in several different ways. This is a fun and exciting workshop that teaches color and pattern that can be used in all your creative textile journeys. 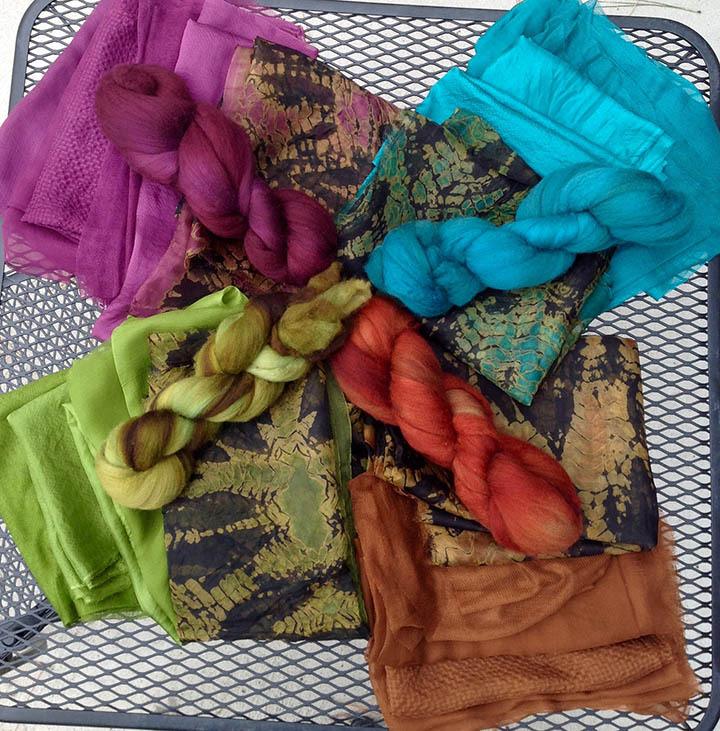 MATERIALS FEE: $25.00 (Payable at time of class) Materials will include a Handout on dyes, Cotton and Silk fabrics and use of dyes, auxiliary chemicals, and equipment. A small supply list will be sent out at time of signup. “Blessing the Blues”…….Indigo is one of the oldest known blue dyes to mankind. Indigo dyeing has been a traditional “way of life” in Ancient Japan, from planting, growing, harvesting, preparing the dyestuff, to weaving and dyeing the cloth. 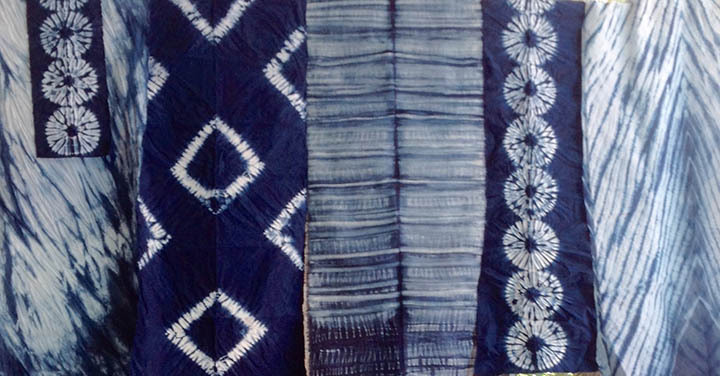 Indigo and Shibori have a magical affinity for one another and in this workshop you will learn why. 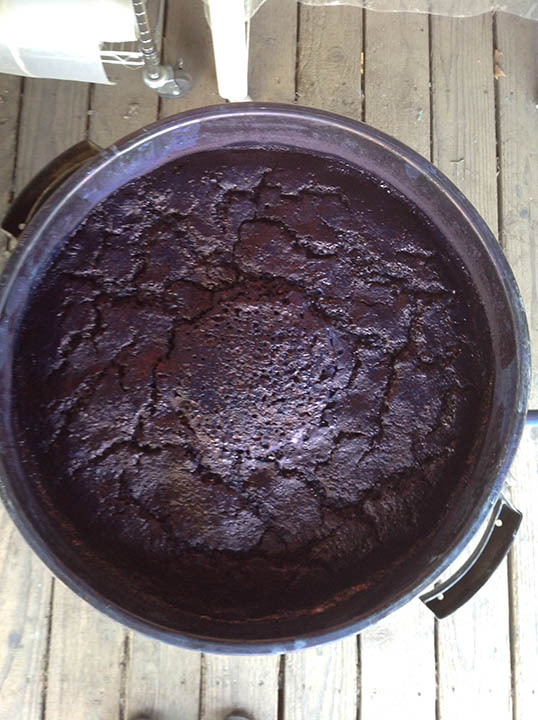 We will start with the Traditional Stitched Shibori Techniques, and you will learn the MAGIC of the Indigo Vat. 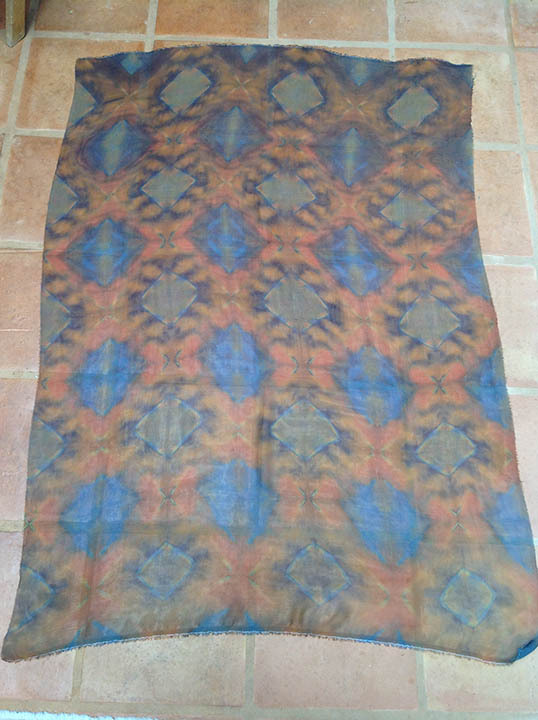 (Please note): Since this class will be offered from the middle of June and July as an “out of doors” class I will be able to take 7 students and if there is enough interest, I will make available continuing day long classes with different types of Shibori. MATERIALS FEE: $25.00 (Payable at time of class) Materials will include cotton, linen, silk and use of the Indigo vat and supplies. A small supply list will be sent out at time of signup.